ePublishing Knowledge BaseePublishing Knowledge BaseePublishing Knowledge Base RSS FeedsHow do I create an RSS feed with multiple topics/taxonomies? The RSS Manager as described in this article is only required to create a single feed that includes multiple topics, categories, site placement, authors, etc. All taxonomy terms can be an RSS feed. 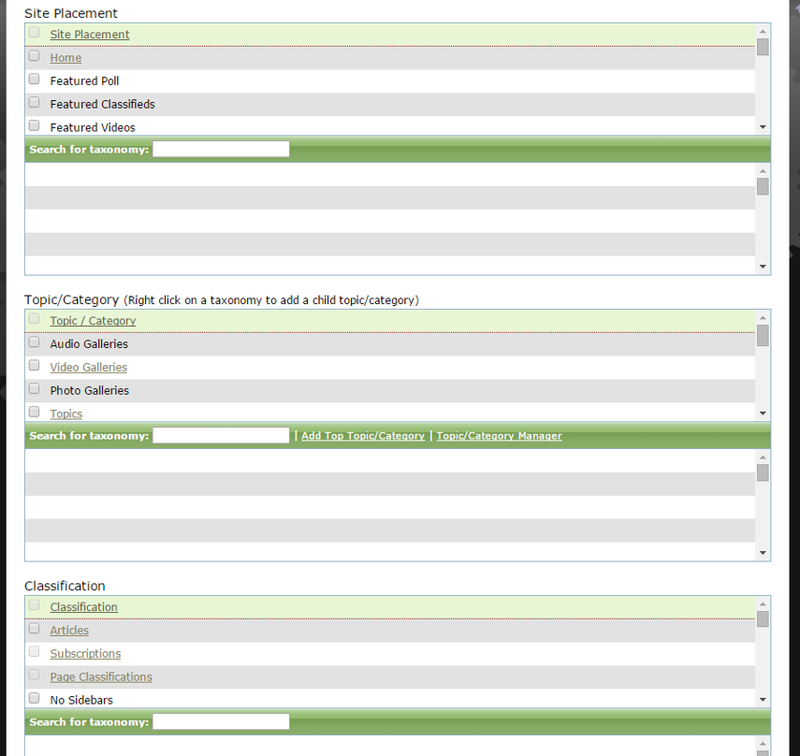 No additional creation steps are required in the RSS Manager to make these operational. Learn more about single-topic RSS feeds. 1. 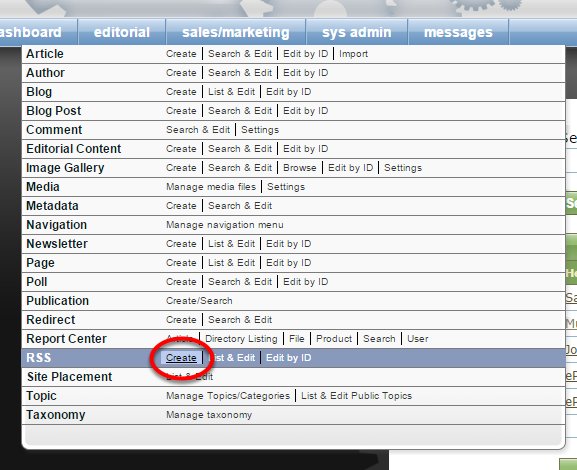 To create a new RSS feed, click Create next to RSS under Editorial on your dashboard. Search for, review and edit existing RSS feeds by clicking List & Edit or Edit by ID. 2. Assign a title to your RSS feed. This is what appears on your website and in RSS feed readers. Zoom: Assign a title to your RSS feed. This is what appears on your website and in RSS feed readers. Do not use any special characters in the title. If you want your RSS feed to show up in your internal website search results, check the box next to Indexable, above the Title. 3. Set the Time to Live, which indicates how often a user's feed will look for new content. Zoom: Set the Time to Live, which indicates how often a user's feed will look for new content. We recommend a default of 60 minutes. 4. If required, add copyright information next. Zoom: If required, add copyright information next. 5. Add the editor's email next, if desired. This could be an individual's email or a group address. Zoom: Add the editor's email next, if desired. This could be an individual's email or a group address. 6. Add a description for your RSS feed, which may appear on your website's list of RSS feeds and on users' RSS readers. Zoom: Add a description for your RSS feed, which may appear on your website's list of RSS feeds and on users' RSS readers. You may add the teaser using straight HTML or use the WYSIWYG editor. 7. Select which taxonomies you'd like to associate with this RSS feed. Any articles or blog posts tagged with those associations will appear in your feed. Zoom: Select which taxonomies you'd like to associate with this RSS feed. Any articles or blog posts tagged with those associations will appear in your feed. The content does not have to have all taxonomy associations you select to appear. 9. When you are ready, click Publish. Zoom: When you are ready, click Publish. Prev: How do I remove a poll from the website? Next: How do I create an RSS feed for a single topic?